…let’s see, are we forgetting anyone? Oh yes, the Inland Empire Food and Wine Festival in Ontario. Ah…spring is in the air and food festivals are cropping up everywhere. Odd thing is, they’re all happening in April. These food festivals are great ways to sample items from local restaurants without having to risk paying for a full meal. First up is the Inland Empire Food and Wine Festival, which is part of the Inland Empire Super Show. It takes place April 10 and 11 at the Ontario Convention Center. If you’re still hungry, the next day is Taste of the Pomona Valley at the Pomona Fairplex. On April 22, you can experience a Taste of the Chino Valley at the Chaffey College Chino Community Center. Two days later, you can have a Taste of Claremont at Taylor Hall in Claremont. Follow the jump for all the details on these events. Italian food lovers in the west side of the Inland Empire have two more choices for fine dining…one old and one new. First up is the wonderful Paisano Ristorante Italiano, which used to be in north Fontana and has relocated to Victoria Gardens. Their re-opening was delayed by a few months, but they’ve open for about a month now, and from what I hear, the new restaurant is more elegant than the last. Dine 909 loved Paisano’s in its old incarnation, but we have yet to visit the Rancho Cucamonga restaurant. If you want to check it out for yourself, it’s at 12574 North Main Street, near the entrance to the AMC Theatres. It’s in the spot formerly occupied by Sisley Italian Kitchen. Free Ben & Jerry’s! Free Ben & Jerry’s! Free Ben & Jerry’s! Thanks to the anonymous tipster who commented on our Tillamook Cheese entry from last week letting us know that today (March 23) is Free Cone Day at Ben & Jerry’s Scoop Shops. According to the online map, they’re all participating in Free Cone Day today. Once upon a time, there was a Scoop Shop in Riverside, but it closed a couple of years back. Hey, anonymous tipster, you do know that Tillamook also sells ice cream, don’t you? Are you a Ben & Jerry’s employee trying to drum up interest? Ben? Jerry? Free cones are available until 8 p.m. tonight. Enjoy! The Tillamook Loaf Love tour rolled into town Friday, bringing cheesy goodness to the Inland Empire. One of three simultaneous I.E. stops for the tour took place at the Fiesta Food Warehouse in Fontana. Other stops Friday were at Stater Bros. markets in Rancho Cucamonga and Ontario. Claremont: Sprouts, 835 W. Foothill Blvd. Ontario: Stater Bros., 1105 W. Philadelphia St. If you’re running in the L.A. Marathon on Sunday, you might see them there! Rialto: Stater Bros., 571 E. Foothill Blvd. and 168 E. Baseline. San Bernardino: Fiesta Food Warehouse, 1578 W. Baseline. A relatively small affair, the crew made up for it in enthusiasm. Along with samples of the medium and sharp Cheddar Baby Loaf cheeses, they handed out recipes and $1 off coupons for Tillamook cheese. Yum! They also showed off their modified VW Microbus, Yum 2. Oh…and they graciously posed for pictures. See them after the jump! Our weekly lunch reviewer Elaine Lehman has written her 90th review — congratulations, Elaine! Elaine is a diner after our own heart…she loves to find cheap and good places to eat here in the Inland Empire. The topic of her milestone review? Tio’s Mexican Food, 16953 Sierra Lakes Parkway, Suite 114, Fontana, in the same center as Mimi’s Cafe. We always look forward to Elaine’s reviews every week, even if she’s never invited us to join her. Perhaps she’ll ask us to number 100. Read this week’s review here. Elsewhere in the paper today, we get David Cohen’s semi-annual look at highlights from San Francisco’s Fancy Food Show. Haven’t yet tried Riverside’s Restaurant Omakase? You better hurry! If you haven’t yet been to Riverside’s highly-praised Restaurant Omakase / Bistro O, you’ve got ’til the end of the month to give it a try. That’s because the founders of Restaurant Omakase / Bistro O will close its doors March 31 in preparation for their new restaurant, The Salted Pig, which is projected to open in early Fall 2010. A farewell celebration has been planned for March 24 through 31 where Chef Brein will offer customers a glimpse at some of the various snacks and appetizers he has created for The Salted Pig’s diverse, internationally inspired menu. They will be offered at a special price during the restaurants regular dinner hours. How else would you celebrate St. Patrick’s Day? Area T.G.I. Friday’s restaurants are celebrating with 1 crispy green bean fries. Makes sense, right? In addition to the appropriately-colored penny appetizer (with purchase of two drinks), they’ve also got half-price appetizers in the bar from 3 to 7 p.m. and from 10 p.m. to close and special prices on Irish drinks: Guinness Draught, Jameson and Ginger, and Irish Car Bombs. If you’re a member of their Give Me More Stripes reward program, you’ll get double stripes on food purchases all day. Inland Empire T.G.I. Friday’s locations include San Bernardino, Riverside, Rancho Cucamonga, Ontario, Corona and Temecula. After lamenting the lack of Loaf Love for the Inland Empire a few months back, it turns out that Tillamook will indeed be bringing some Loaf Love our way this week. Update: More dates have been added! Click here to see them! It seems the modified VW microbuses will be flooring it in Fontana and steering into San Bernardino after all. Unfortunately, no other Inland Empire dates appear to be scheduled during this “Los Angeles” leg of the Loaf Love Tour. Coincidentally, on our trip to Costco the other day, we purchased some of that delicious Tillamook vintage white sharp Cheddar cheese. Mmm…tangy! 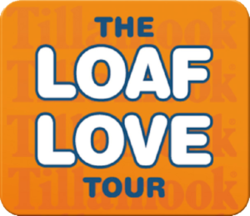 Did Dine 909 have any part in bringing the Loaf Love Tour to the Inland Empire? We’ll probably never know, but we’d like to think so. You can thank us silently as you sample that yummy Tillamook cheese.